Your home: it’s your personal sanctuary, your refuge from the world. You’ve worked hard to create an environment that your family can enjoy. So when you want to take in the pleasures of your our yard, landscaping, pets, patio, pool, or fun with your kids and outdoor parties, you deserve to do so in complete comfort. For all that you’ve put into your home and yard, you shouldn’t have to be at the mercy of annoying insects and their painful bites. 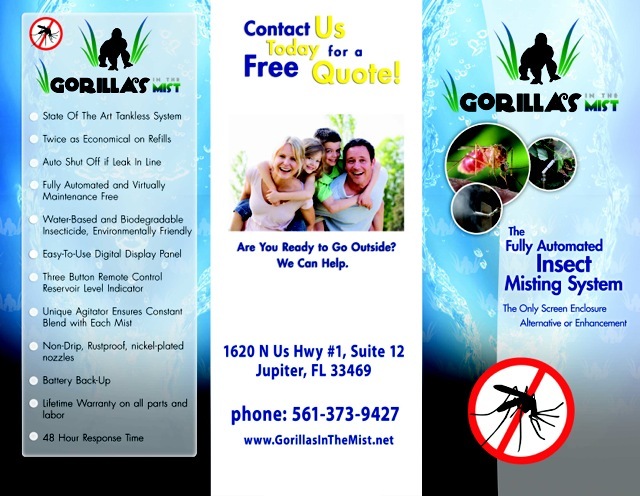 Fortunately, you won’t with Gorillas In The Mist…the revolutionary automatic insect misting system that effectively eliminates mosquitoes and other insects from your yard. There has never been a more effective and convenient method for preventing mosquito bites in your yard. Better still, the Gorillas In The Mist system works automatically and is virtually maintenance free. You’ll never again have to spray your kids with messy repellents or remember to fog your yard before an evening cookout. The Gorillas In The Mist system sprays a very fine mist of environmentally friendly product through nozzles installed around the perimeter of your yard. The mist settles on the grass and landscaping, killing any mosquito that comes in contact with it. The system is timed to mist at dusk and dawn when mosquitoes are most active and beneficial insects like bees and butterflies are not. It also kills or repels other unwanted pests like spiders, flies, no see-ums, fleas, ticks and gnats. Gorillas In The Mist now offers your family a tankless option instead of a drum. The tankless unit is an attractive, state of the art outdoor misting system. You can place it anywhere in your yard that is near a hose bib and electrical outlet. The tankless unit is convenient, simply snap in a cartridge of concentrated botanical insecticide and the automated controller does all the work. Each time the system is activated, the tankless unit precisely mixes a fresh batch from concentrate. The smart cap on the cartridge tells the unit the proper dose of botanical insecticide to address your mosquito problem. With this technology you tailor the amount of active ingredients and gain control over mosquitoes and other biting insects while using the least amount of insecticide. Meaning, the most cost savings for you the customer! Unlike most other insect control products which contain highly toxic ingredients that are harmful to humans and pets, Gorillas In The Mist uses products that are produced from natural ingredients ad have been shown by independent lab tests to be non-toxic. Importantly, toxicity testing for Gorillas In The Mist products included testing for heavy metals, aquatic toxicity (does harm to marine life), and for dermal (skin), ocular (eye) and inhalant toxicity. Also, all our products are completely odorless and non-fuming. 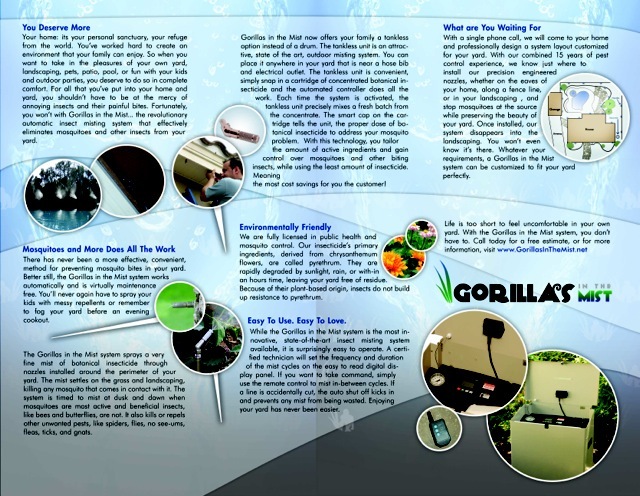 While the Gorillas In The Mist system is the most innovative, state-of-the-art insect misting system available, it is surprisingly easy to operate. A certified technician will set the frequency and duration of the mist cycles on the easy to read digital display panel. If you want to take command, simply use the remote control to mist in-between cycles. If a line is accidentally cut, the auto shut off kicks in and prevents any mist from being wasted. Enjoying your yard has never been easier. With a single phone call we will come to your house and professionally design a system layout customized for your yard. With our combined 15 years of pest control experience we know just where to install our precision engineered nozzles, whether on the eaves of your home, along a fence line, or in your landscaping, and stop mosquitoes at the source while preserving the beauty of your yard. Once installed, our system disappears into the landscaping. You won’t even know it’s there. Whatever your requirements, a Gorillas In The Mist system can be customized to fit your yard perfectly. Life is too short to feel uncomfortable in your own yard. With the Gorillas In The Mist system you don’t have to. Call today for a free estimate or contact us more information.